While it’s not too difficult to clean up the physical evidence of your pet’s mess, unfortunately the odour can hang around. When it’s not cleaned properly, it can even encourage them to keep soiling. This is why it’s important to get the area thoroughly cleaned and deodorised. Really Cheap Carpet Cleaning Brisbane is a specialist in removing pet odours and stains. Most importantly, the products we use are 100% safe for animals and children. This means the carpet can be used immediately after cleaning. 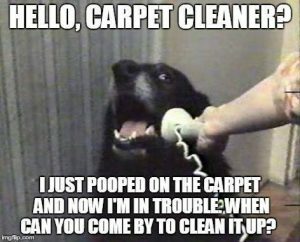 If you have issues with your pets repeatedly soiling an area, contact us today! We can even offer a discount on multiple services to save you time and money! You can fill out our contact form and find out what special we can offer. https://www.reallycheapcarpetcleaning.com.au/wp-content/uploads/2018/02/carpet_cleaner.jpg 380 472 pippa https://www.reallycheapcarpetcleaning.com.au/wp-content/uploads/2017/05/Logo.png pippa2018-02-01 01:49:012018-02-01 01:49:01"Hello?...Carpet Cleaner"?? Make Your Own Cleaning Spray It’s Superbowl Monday!